In the late 19th Century, Poly started as the "Commercial School" in downtown San Francisco. 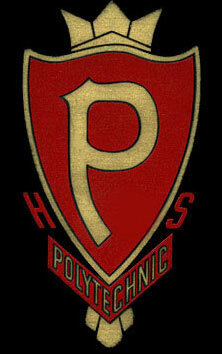 By 1890 academic subjects had been added to the previous commercial-only curriculum and the school got its name: "Polytechnic High School". In 1900 the commercial courses and their instructors left to form the "High School of Commerce" and 150 students were left at Poly, located in old wood and brick buildings on Bush at Stockton (over the Stockton Tunnel).